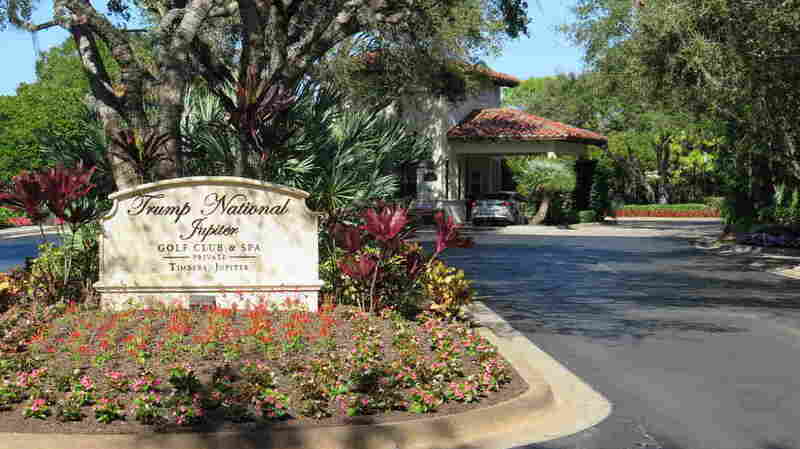 Trump's Company Loses Lawsuit Filed By Golf Club Members : The Two-Way The president's business canceled memberships in the National Jupiter Golf Club, but kept the fees. A federal court has ruled the company must refund nearly $6 million. President Trump's company has lost a lawsuit filed by members of a golf club and must refund them nearly $6 million. They said the business cancelled memberships but kept the fees. Since taking office, President Trump has stepped away from running his business empire. But in Florida, a federal judge has handed a legal defeat to the organization that bears his name. He ruled that Trump National Jupiter Golf Club must refund members nearly $6 million. It's a case that began in 2012 when Trump bought the struggling golf club from Marriott Vacations Worldwide. He paid just $5 million, a bargain price. But as part of the deal, he had to assume some $50 million in debt, money owed to members who put down refundable deposits and now wanted out of the club. In a letter and a meeting with club members, the company told those who wanted out, they would have to continue to pay annual dues but couldn't use the club. Plus, they wouldn't receive their refunds until new members were found to replace them, a process that might take years. Disgruntled members said Trump was unfairly changing the rules of their membership contracts and they filed a class action lawsuit. Their lawyer, Brad Edwards, says Trump essentially revoked their memberships while keeping their dues and deposits. Edwards says, "The most important characteristic of a membership is access to the club. Well, there's no doubt that he took away access to the club and, ergo, he took away membership." In a ruling Wednesday, U.S. District Judge Kenneth Marra agreed with the plaintiffs. He ordered the Jupiter Club to refund 65 members their deposits plus interest, for a total of nearly $6 million. Although Trump wasn't personally named in the suit, his videotaped deposition was played in court. His son Eric testified at the trial. During the nearly four years of the case, at Trump's urging, more than half of those who wanted out of the club changed their minds and took their names off the resignation list. That meant Trump could hang on to tens of millions of dollars in deposits, helping turn around the club's finances. Although Trump lost in court, his hardball business tactics were effective. Edwards says, "Clearly his interpretation of the contract and what he could do legally were wrong and flawed as we've just proven. But from a business perspective and purely as a business-minded move, it worked out well for him." In his decision, the judge doesn't refer to Trump as president. In a footnote, the judge says, "At all times relevant to this lawsuit, Donald J. Trump was a private citizen. As a result, the Court will refer to him as such in this decision. In doing so, the Court means no disrespect to him or to the esteemed position he now holds." In a statement the Trump organization said it disagreed with the judge's decision and that, "At the time Trump purchased the Club, it was suffering financially, making it unlikely that these members would ever get back their deposits." And, the president's company says, it will appeal.